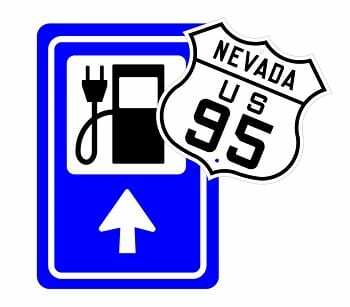 The first in a series of EV charging stations planned for U.S. 95 is up and running. One of four electric car charging stations has opened along the portion of the U.S. 95 highway that runs from Las Vegas to Reno. The 450-mile stretch of road (an approximate 7 hour car ride), that links Southern Nevada with Northern Nevada’s largest city, now has its first electric vehicle (EV) charging station ready to serve in Beatty. Plans for the “electric highway” were announced last summer. Governor Brian Sandoval announced plans for the eclectic car charging stations back in the summer of 2015; a project that was developed to help short-range electric vehicle drivers to complete the 450-mile drive. Funding for the project is coming from NV Energy and Nevada’s renewable energy tax abatements. Last week, officials from the Nevada Governor’s Office of Energy and NV Energy, informed lawmakers that the station in Beatty, which is located at the Eddie World gas station and convenience store, is operational. The Beatty site is managed by the Valley Electric Association because NV Energy does not serve the area. To be able to build the station, Valley Electric received a $15,000 grant via the state Energy Office. Presently, officials are still negotiating partnerships to build charging stations at the three other recently identified sites: Hawthorn, Tonopah and Fallon. It is believed that the electric car charging stations will help to generate business for rural economies. There are an estimated 1,400 electric cars registered in Nevada. Building these stations will encourage EV drivers to take their green vehicles on longer drives, helping them overcome range anxiety (an EV driver’s fear that they will run out of power during long distance travel, where no or insufficient charging infrastructure exists). These stations will not only benefit the environment, by encouraging more electric vehicle use, but they are also likely to be beneficial to the rural economies because, as drivers stop in small towns to charge their cars, they can explore the towns while their vehicle is powering up. The three other electric car charging stations planned along this Nevada stretch of the U.S. 95 highway are scheduled to be operational by summer. Let’s walk around the desert in the blazing heat of summer, freeze of the winter, or desolate darkness of night while I wait hours for my electric car to recharge. What a great idea! In addition, where do those EV drivers think their precious electricity came from? If not the 10% from alternative energy , it came from burning coal or other dirty carbon-based sources. Then, calculate the amount of energy lost from electrical transmission from the power origin to that EV, and you will see that electric car drivers are less about being green and more about pretending to be green. The only proven economically viable solution is to convert biomass (garbage, sewage, etc.) into methane and related gases (not precious water) that can be converted to hydrogen in a closed loop system (saving water and electricity). HydrogenXT is quickly becoming the leader in what is called Steam Methane Reformation. This company is the future. EV’s are environmental and economical relics of a false technology that will be a distant memory once fuel cell (electric) vehicles zoom right past them.